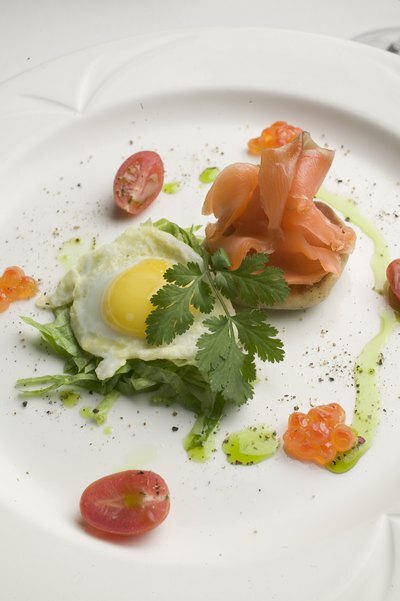 Smoked salmon is a wonderful, elegant dish that can be served for breakfast, lunch, an afternoon snack, or dinner. There are many ways to serve it, and is certainly beautiful and very tasty on a platter alongside the proper food to compliment its flavor. Remember, this can all depend on your personal taste, and what time of day you are serving the salmon. 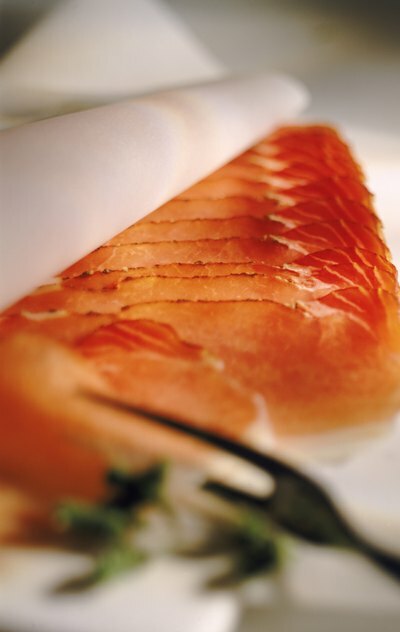 Buy your smoked salmon at a fish market or a local grocery store that you trust for quality. You can smoke the salmon on your own, but it is time consuming and takes some skill. So your local market is the easiest option. Look for very thinly sliced fish that looks pretty and does not smell fishy. It has more of a clean, pure, smoky aroma and flavor. Be sure to ask for a sample taste before you buy. Decide what time of day and how you will be serving your tray. For lunch, afternoon, or dinner, toast points are probably better with some more elaborate sides. Breakfast will be more simple. 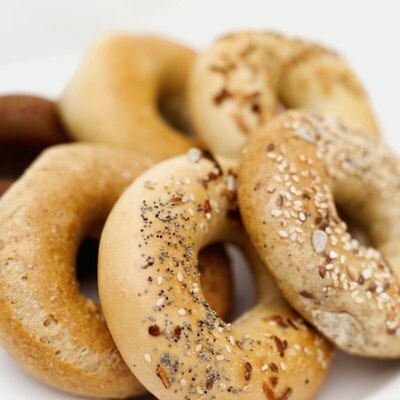 Toasted bagels (onion or everything bagels) are recommended. 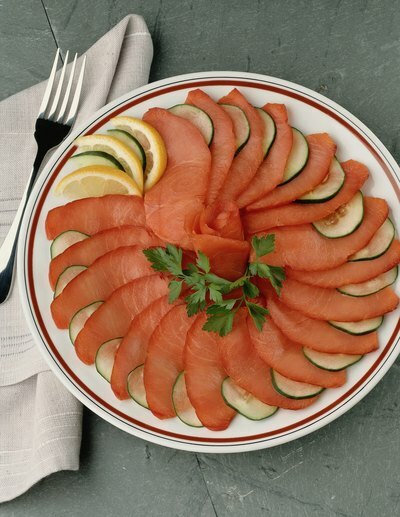 Place the salmon slices in the center of a large, attractive tray. Layer it so it looks pretty. Provide a pretty container for the cream cheese on one corner of the platter. Slice your onions and tomatoes fairly thin, and spread them around the salmon, almost like you are framing it. Pile some capers in a corner of the dish, alongside some lemon slices. Not everyone wants to use lemon, but its a nice option for those who do. It also adds some nice color to the platter. 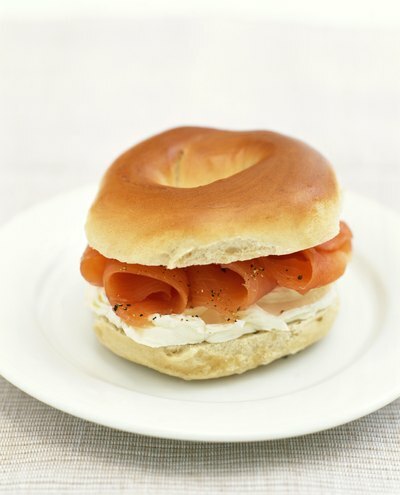 Arrange the bagels on a separate plate, because the salmon platter has a lot of ingredients that are moist, and your bagels may get soggy. Toast them lightly, slice them in half, and serve them as a side. Provide utensils for spreading the cream cheese and layering the ingredients. 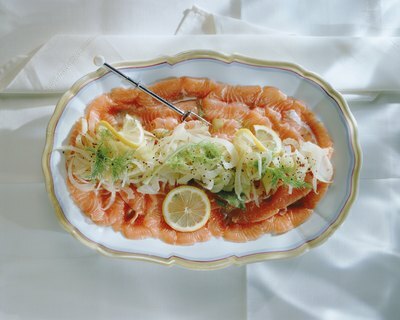 Get even more creative with an afternoon or evening smoked salmon platter. For this you may need a larger tray. With so many colors available, you can arrange the salmon tray like artwork. The salmon should always go in the middle of the platter. You can layer the thin slices on top of each other, or roll each individual slice up and place them side by side for a different look. Arrange your tomato, onion, capers, black olives and sliced boiled egg around the salmon, once again, like you are "framing" it. Your lemon can go around the very edge, thinly sliced. 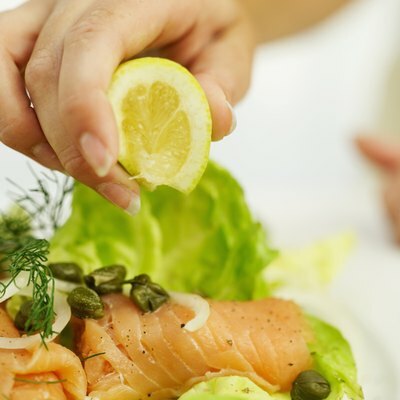 Then place fresh dill with the whole stems on top of the salmon as a garnish. Dill has a wonderful aroma and partners very well with salmon. Place the toast points around the very edge of the platter if you have room, or serve them on a separate dish. 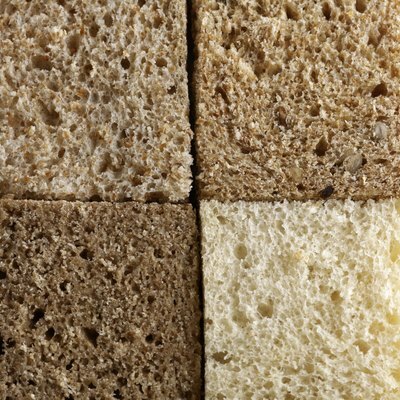 This can be any type of bread you choose, toasted and cut into triangle shaped pieces. Cream cheese can also be served as a side, but that is usually something that goes better with a breakfast platter. Get even more fancy with your smoked salmon tray, by perhaps using a silver platter to serve, and some tall martini glasses to hold the sides. You can spread the salmon out, garnished with the dill and surrounded by toast points. Then serve the capers, onions, etc. in martini glasses. This makes a very elegant, impressive display. Be sure all of your ingredients are very fresh. Norwegian salmon is some of the best, if you can find it. This is finger food, so have some warm water with lemon in small bowls so your guests can rinse their hands. Many restaurants offer this, so it is perfectly acceptable.